How about May sales results? Is agentbubble going to post those or did I miss it? Are sales declining, flat or rising? Try this Lyon agent's blog. She has several charts. Sales waaay up, 2x last May, inventory # months 1/3 of peak last August. Remembering that # months inventory is clogged up by short sale inventory that really doesn't sell, the rest is moving pretty well. 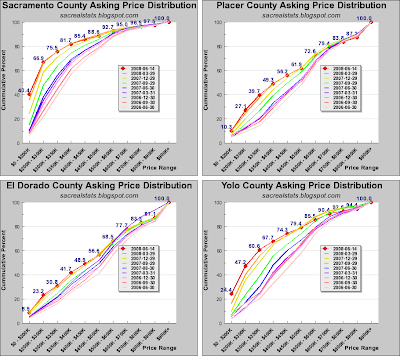 Our market has a good mix of home prices that fit with the current lending environment (non jumbo loans, FHA and others) and fit the investor criteria. 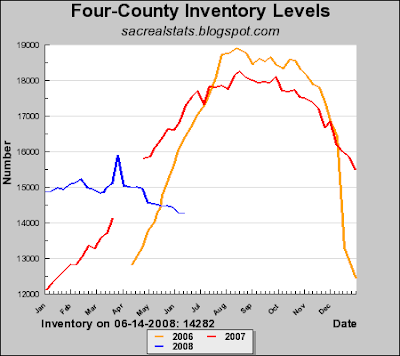 The link to Lyon Trendgraphics for May for Tricounty claims months of inventory has fallen below 6 months for both April and May. 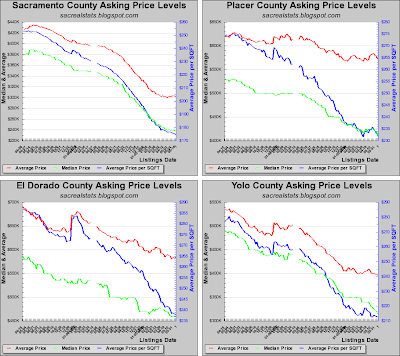 The rule of thumb would say prices should stablize which seems to be occurring. Is it primarily investors buying? If so how deep does the investor pool seem to be? Will it run out soon? I hear its about 50/50 in the under $250K range investors/buyers so there's plenty of buyers getting pushed aside to the next. The investors seem to have been pulling non performing $$ from CDs and the stock market and putting it into either rentals or oil! But theres plenty of financing available in these price ranges. The quick price dive over the past few months has to do with the huge increase in sales in the low end, making a larger contribution. 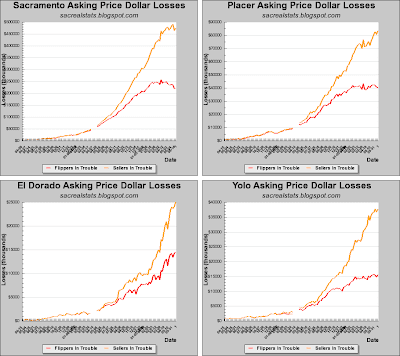 IMHO, Sacramento was a year early into and is stabilizing a year earlier than most of the rest.... seems like the national news I hear mimics our problems last year. expect more squeezing. travel cost up up and away. UPS or Fedex will have to raise prices (most are paying diesel rates of yesterday...when contract ends...u know what will happen). Sacrament,which is a bunch of state workers will have negative earnings...yeah, No such thing as COLA in state govt. 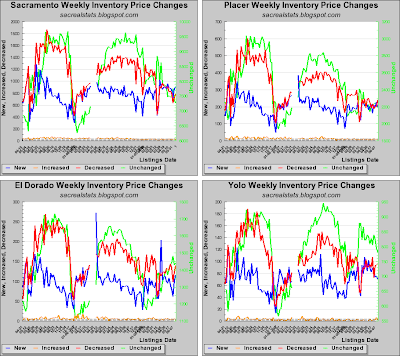 with rates rising, the median income does not support the buying of hoomes here in sac. sac will drop another 10% minimum within this year and will continually drp at a lower rate each year for the next 10-20 years. "sac will drop another 10% minimum within this year and will continually drp at a lower rate each year for the next 10-20 years." It is bad today, but this kind of prediction is less than useless. Sources? Are you still looking for the "experts" to tell you what is going on? For the last two years these "experts" have done nothing but deny reality, manipulate statistics, hide facts and outright lie to try to talk the market back up. Why are you still listening to these people? If you can't look at unfiltered data and see trends yourself and then draw your own conclusions you might as well just dump your cash off at the horse track. Go Big Brown! Be easy on Sacto EJ. He clearly is lost in the woods looking for guidence! 1) Craig's List rentals: Inventory up 100%, rates down 10-15%. Even Sippn's investors will have problems getting some cash flow. 2) Gas Stations: Notice the number 4 anywhere? 3) State budget: Notice the big surplus and the unbridled hiring by the state lately? 5) Subdivisions: Half built, stalled construction. Who do you think is paying for all those lots? Is their value going up or will they get dumped for $.10 on the $1.00? Notice any rusting bulldozers parked by the side of the road with for sale signs lately? Notice any developers in BK? 7) Shopping Centers: Traffic down, flat sales considered a successful trend, vacant space going begging. 9) Mr. Mortgage: Check out his blog. 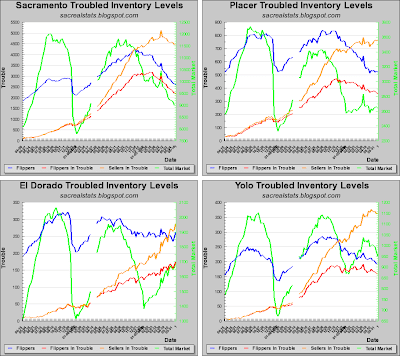 It is possible 2010 will be much worse than the 2008 record foreclosures (still occuring). There are 2x's the number of loans headed toward default in 2010 vs 2008. And many people said what happened in 2008 could never happen. Even if 2010 isn't worse, the effect will prevent any appreciation for years. 10) Business Week: Based on past trends, in 2006, BW predicted there would be no appreciation in the value of homes until 2015. I could go on & on & on, but I hope you get the point. This train is headed south and isn't stopping at any stations for the FB's to exit. 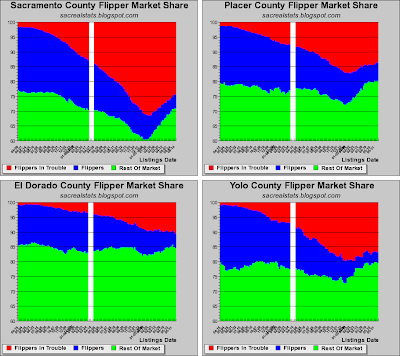 Ultimately, the market will hit a bottom and probably stay there a few years until demand matches supply. This is still an attractive place to live and we still have some population growth (though that could change). Eventually, wages will start to grow again and combined with lower prices, it will make housing more affordable. We are not there yet and probably will not be there until 2011 at the earliest. That being said, there are some nice deals around and it is now possible to buy some houses for for the after tax equivalent of rent, after you put 20% down. So you need $50,000 to sink into a home to get that benefit. So Sacto EJ, keep you head up and look around. You can see what is going on in this market without needing sources. I don't agree with the 10-20 years prediction, because no one can see that far out into the future. The further you go, the less viable the prediction. But is is pretty simple to see the next few years are going to be tough and the next 5 years will be less than a cake walk. 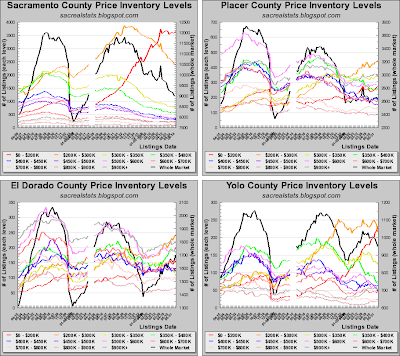 You know the market is distorted when you have 4.75 months of inventory and prices are falling like a rock. 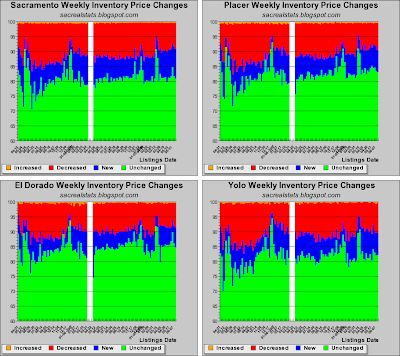 If you look at my weekly inventory graph, the market may have reached an equilibrium at ~14000. My theory is the banks are processing REO as fast as they can, and sales are matching that rate. The banks have a huge pile of shadow inventory, but they feed it into the market at the perfect rate to keep the fire burning. All of that is known, and there's plenty more unknown. I agree with it all. Craig's list is also benefiting from the movement of rental listings from traditional media to itself, so how do you get a good comparable measure? 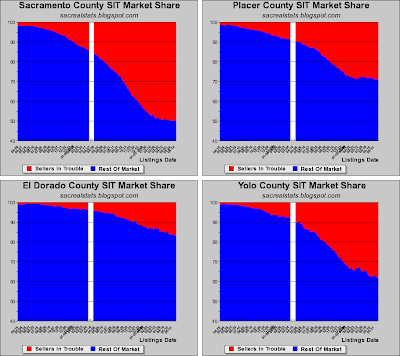 State employment grew 4300 in Sac in the past 12 months, local government grew 1000. Not including recently approved hospital expansions, health care increased 3100. 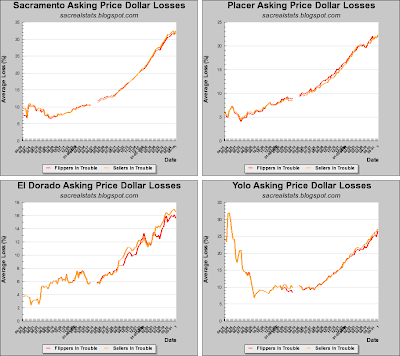 Sac Bee - sorry thats just progress, exposed early by the recession. Can anyone explain why interest rate keep rising ? Federal reserve keeps it low for a months. I understand that this rate depends not just on fed.rate, but anyway, why it is climbing to almost 6.4? Does not it push home prices even lower? Any forecasts? Thanks. Can anyone explain why interest rate keep rising ? Federal reserve keeps it low for a months. Easy. Look at the 2 and 10-year T bill vs the 30. The yield curve is inverting again, which means banks perceive short term risk, and are less willing to lend. Nobody trusts anybody anymore. That's why the GSEs are the only ones doing loans. And that's why mortgage rates are climbing. 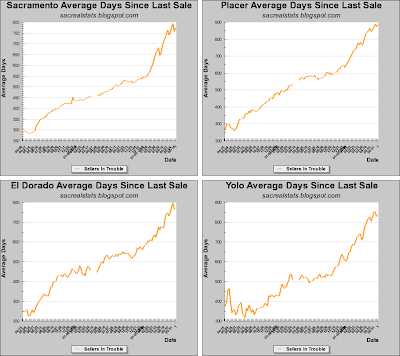 I there somewhere that I can view a 20 year sales trend chart for sacramento and sacramento neighborhoods? Thanks!